How did you become a researcher? I practised as a surgical oncologist in China before I came to Australia and it helped me to understand how frustrating it can be to clinical manage patients with latter-stage cancer. In Australia I did my PhD in cancer research and I diverted by career to basic science with the aim of finding treatments for metastatic melanoma. This is a beautiful country but it has the highest incidence of melanoma in the world – it particularly impacts young people aged 30-45. I was shocked by the scale of the problem and wanted to do something about it. We grow melanoma cells in the laboratory, we use melanoma cells from patients and we have laboratory models and we test our treatments. We screen everything from genes to proteins and other possible factors affecting the outcomes of melanoma patients, then we look at ways to manipulate the cellular mechanisms and pathways. 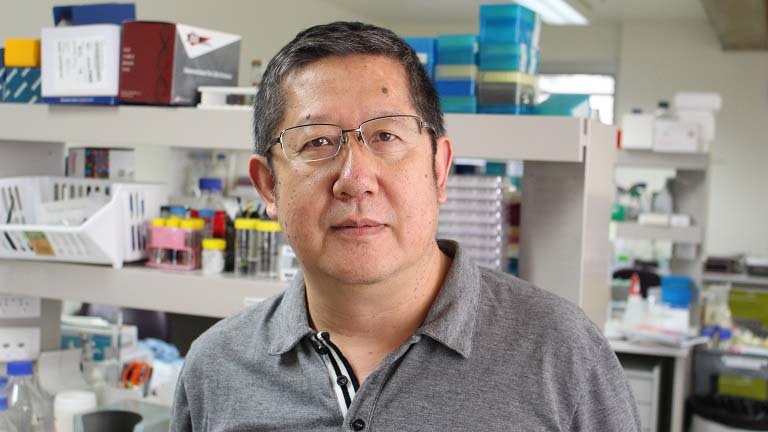 Professor Xu Dong Zhang is a senior researcher with the University of Newcastle and co-leader of the HMRI Cancer research program. His work focuses on the mechanisms behind the development of melanoma and creating potential treatments to stop melanomas from spreading and potentially becoming fatal. Melanoma or skin cancer is the third most common cancer in Australia, with two in every three Australians diagnosed with skin cancer by the age of 70. Professor Zhang is a world leading researcher in the field of translational melanoma research, working for the past 15 years to improve the outcomes of the 400,000 Australians treated for skin cancer each year. There is no cure for skin cancers which spread beyond the original site of detection. Using advanced molecular and biochemical techniques, Professor Zhang’s research aims to manipulate the chemical makeup and signaling properties of cancer cells which make them so difficult to treat. In 2013, Professor Zhang discovered a key molecule called PIB5PA which is essential for the normal functioning of cells and is commonly reduced in melanoma cells. By targeting molecules like PIB5PA and other important markers of melanoma cells which make them able to evade normal cellular death mechanisms, Professor Zhang is pioneering personalised treatments formetastatic melanomas which may for the first time, provide an effective treatment for patients with advanced skin cancer. Professor Zhang has received many prestigious awards invited presentations throughout his career including the HMRI Young Researcher of the Year in 2004 and presentations at the World Congress for Melanoma. Professor Zhang has strong collaborative links with local and international researchers and also with biotechnology companies working to improve current and novel treatments for melanoma. Professor Zhang has established fruitful collaborations with several Top 20 Universities in China, including the University of Science and Technology of China, the Sichuan University, and the Sun Yat-sen University. He also holds honorary professorships at a number of other institutions in China, including the Anhui Medical University, the Fourth Military Medical University, and the Shanxi Cancer Hospital and Shanxi Cancer Institute. He is an honorary director of the Cellular and Molecular Biology Laboratory at the Shanxi Cancer Hospital and Shanxi Cancer Institute. His global reputation is reflected by his H Factor of 31, his invited presentations in many international and national conferences, and his appointment on the editorial board for a number of scientific journals. Professor Zhang has contributed to over 120 research papers and received in excess of $14 million in grant funding.